The Lorraine Motel in Memphis, Tennessee was thrust into the international spotlight on April 4, 1968 when Rev. Dr. Martin Luther King Jr. was murdered by an assassin’s bullet while standing on the second floor balcony. Since that fateful Thursday in 1968, the Lorraine has been through a series of changes culminating in creation of the National Civil Rights Museum complex with the hotel at its center. The former motel now features exhibits tracing the history of the Civil Rights Movement in the United States from the days of slavery to today. The small 16 room motel purchased by Walter Bailey and renamed after his wife Loree was built in 1925 and operated for 20 years as the Windsorlorrine Hotel. During the segregation era, Bailey operated the motel as upscale lodging that catered primarily to a black clientele. It was Bailey that added the second floor, swimming pool, and drive-up access for additional rooms on the south side of the complex. He then changed the name from Lorraine Hotel to Lorraine Motel to reflect the new additions and easy access to the rooms from the parking lot. Throughout the 1960s the Lorraine had a series of the most famous musicians in the world stay at the motel while they were recording at Stax Records in Memphis. Some of the famous musicians that temporarily called the Lorraine home were Aretha Franklin, Lionel Hampton, Otis Redding, and Ray Charles. The Martin Luther King Memorial Foundation bought the motel for $144,000, following foreclosure in December 1982. It was determined that it would become a civil rights museum and renovations were started almost immediately. In desperate need of renovation and repairs, the main museum temporarily closed in November of 2012. After a $27.5 million renovation that focused largely on mechanical systems upgrades, expansion of the lobby, and creation of a new educational center, the museum was reopened in 2014. Located about six blocks east of the Mississippi River, on the south edge of downtown Memphis, the museum is owned and operated by the Lorraine Civil Rights Museum Foundation. The Lorraine Motel however is owned by the Tennessee State Museum and leased on a long term contract to the Foundation to operate as part of the museum complex. On October 21, 2016, the museum was honored by becoming a Smithsonian Affiliate museum. Bailey’s wife, Loree, suffered a catastrophic stroke just hours after the assassination of Dr. King and passed away five days later. Following the assassination of Dr. King, Bailey withdrew Room 306 (where King died) and the adjoining room 307 from use. The Martin Luther King Memorial Foundation bought the motel for $144,000, following foreclosure in December 1982. Walter Bailey, the Lorraine Motel owner, passed away in July 1988. The rifle used by James Earl Ray to murder Dr. Martin Luther King Jr. is on display at the museum. 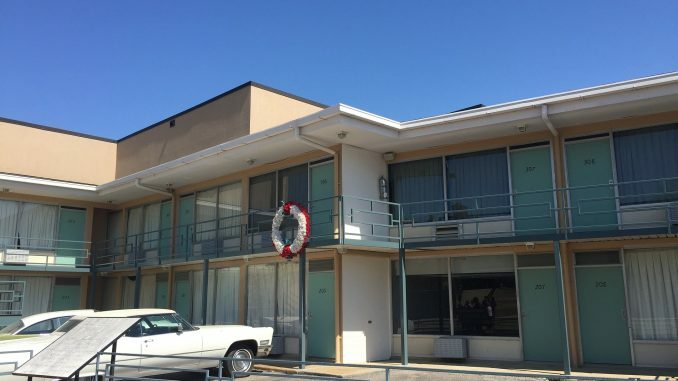 The complex is located at 450 Mulberry Street, with all properties except the Lorraine Motel owned by the Lorraine Civil Rights Museum Foundation. Room 306 where Dr. King was staying when he died. Room 306 and the neighboring 307 have been closed and preserved since April 4, 1968. A replica of a Memphis sanitation truck. Dr. King was in Tennessee to take part in the Memphis sanitation strike. The strike had begun in February of 1968 after years of unfair wages, poor working conditions, and the crushing death of two black workmen (Echole Cole and Robert Walker) taking refuge from the rain inside a garbage truck. They two men were in the garbage truck because they were not allowed to enter the cab of the truck. A replica of the bus Rosa Parks refused to give up her seat in that initiated the Montgomery Bus Boycott of 1955-1956 (the actual bus is in Dearborn, Michigan at the Henry Ford Museum). Replica of the Greyhound Bus destroyed by white supremacists during the Freedom Rides. Jacqueline Smith was the last resident of the Lorraine Motel. Ms. Smith had previously worked at the Lorraine as a housekeeper, and lived at the motel from 1973 to 1988. She was evicted when the motel was closed, and protested the eviction for more than 30 years. Her protest is based on her conclusion that it was against the teachings of Dr. King to remove her from her home in order to make it a museum.